An interesting collecting area of Indianapolis 500 memorabilia are panoramic photos. Since the opening balloon race of June 1909 through 1957 and later on in various years since then, panoramic photos have been produced with several different photographers credited with making them and a variety of types and sizes produced. In the pre-World War I era Bretzman, North H. Losey, of Indianapolis and H.H Coburn (Coburn Photo & Film Co.) were the predominant panoramic photographers with one* known balloon panoramic from the 1909 balloon race by the Indianapolis Photo Co. Those made from 1909 through 1957 are known as first generation panoramics with those after, second generation. After WWI, Kirkpatrick of Indianapolis became the official photographer of the Speedway and they produced panoramic photos into the late 1930's where at that time *Tower Photos became the official Speedway photographers and began to produce panoramic photos with Charles J. Bell given credit as the photographer. After World War II, *Tower Photos continued to produce the photos as did *O'Dell Shields, famous for their black & white postcards, in the 1950's. In 1979 the Speedway took a color panoramic photo from the top of the Control Tower and in 1993, one was taken in the press box area at the end of the Paddock Grandstand. For the inaugural Brickyard 400 in 1994, a traditional line up picture was shot at the start finish line and the same was done for the inaugural U.S. Grand Prix in 2000. Some of these later photos were available as posters and also photographs. For the Balloon race of June 5th, 1909 a panoramic photo was produced taken from the infield facing east showing the balloons and spectators there for the event. It measures 38" long x 7 1/2" wide and is in black & white as are all panoramic photos through 1957. Note this version is from a slightly different angle than the one above and is credited to the Indianapolis Photo Co. There may be a panoramic of the Motorcycle events of August 13-14th, 1909, although one has not been found yet but there is one for the Auto Races the following weekend and it is perhaps the largest Speedway panoramic coming in at 5' 1" long x nearly 10" wide. Many of the pre-World War I panoramics were of this large size. The 1909 Auto Races photo was taken from the infield facing west or toward the track and in the area about 30 yards behind where the scoring pylon is today. There are panoramics of the 1910 Auto Races and of the Aviation meet, but it is uncertain if there is one for the Balloon Races in September. The 1910 Aviation Meet panoramic shown below is a reproduction. Beginning in 1911, a traditional line up before the start was taken for the first time* at the Speedway with the drivers and mechanics lining up on the start finish line (as seen in the 1912 below) with the panoramic camera on the ground, on a platform or on the back of a truck. Other panoramic views were shot during the pre-WWI era, some similar to that of the 1909 Auto Races and others taken from other angles along the front stretch or even the turns as in 1912 from the outside of turn one which was also made into a panoramic color post card. Coburn produced probably the widest at 14" and the shortest in length is the 1947 at just under 2'. By the 1920's, the size stabilized to around 3' to 4' long by about 8-10" wide and remained so through 1957. The later color panoramics vary in size from 4-5' in length to around 2-3' and a width of 8-10". This color panoramic from 1963 is a little bigger than the 1947 and appears to be taken from the Tower grandstand. An aerial panoramic taken in the early 2000's (note the road course). A shot taken before the 2005 race from Grandstand“E" . Noted aviatrix Amelia Earhart was an honored guest in 1935 and is seen next to Speedway President Capt. Eddie Rickenbacker. Auto racing panoramic photos were not just limited to the Indianapolis Motor Speedway as there are those from other tracks as seen in the 1915 Minneapolis and 1921 San Francisco photos below. 1957 was the last year for the traditional line up as the teams felt they needed the time to continue preparation of their cars for the race. As mentioned though, there were ones done later, but not quite to the extent of the 1909 through 1957 period. Oddly enough, a 1957 panoramic photo has never been found although home movie footage clearly shows people lining up for the photo that year. One theory as to why one has never surfaced is that the negative was somehow rendered unusable before any could be printed. A couple of interesting aspects about panoramic photos is the distorted view of the track bowing out toward oneself due to the nature of panoramic cameras. This is especially true on early panoramics taken from a different angle other than the line up. 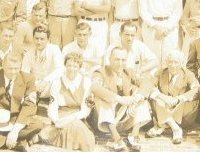 Also, because the camera moved slow enough, one could run to the other side and appear in the photo twice as seen with Chief Timer & Scorer Chester Ricker (in the white suit wearing the beret) and the mechanic in the white t-shirt next to him from 1941. As for rarity, the pre-WWI era panoramics are the toughest to come by. After WWI through 1941 they do get progressively easier the further up you go, but none are by any means common or easy to find. After WWII first generation panoramics become a bit easier but again they are not common or easy to find. Some post WWII first generation panoramics and some of the more current second generation panoramics may still be available from the Speedway photo shop.